“I actually wasn’t expecting to win any superlatives. I mean I know I have been in high school for four years, but I still felt like a new student. Having people actually know my name is pretty amazing,” said Konhaeuser. Nicole Konhaeuser is not your average dual athlete. Most dual athletes participate in two sports in different seasons. For example, one does swimming in the fall and soccer in the winter. However, for Nicole she played soccer and basketball in the same season. Time and time again, she would run off the court, put on her cleats and play for the girls’ soccer head coach, Scott Paul. “I used to play soccer in middle school, but I sprained my ankle and my ankle wasn’t the same. I was hesitant in my freshman and sophomore years but I had Scott Paul as a teacher and he told me to come out. I wanted to push myself,” said Konhaeuser. On December 4th, 2015, the Lady Conchs basketball team were looking for their first win of the season against Ransom Everglades. That same evening, the soccer team was facing Westminster Christian. Konhaeuser led the basketball team with six points, four rebounds and three assists leading the team to their first victory, 41-28 over the Warriors. Within 15 minutes after the game, Nicole switched jerseys and rushed to the field. Already sweaty from the basketball game, she scored a goal and the Lady Conchs won 6-2 over Westminster Christian. “My biggest inspiration is my team. Every time we would lose a game I would see their faces. Every time we failed at doing something together, they inspired me to practice harder, play smarter, do better. My teammates really made me into the person I am at this moment when it comes to athletics, games, practice. They taught me to leave everything on the field no matter what is hurting,” said Konhaeuser. Not only does she play two sports, Nicole also has found time for weightlifting something she calls “not normal for girls”. “I used to be really skinny and I would never weigh more than 85 pounds. I found myself getting pushed around in every sport. I decided to bulk up and get my protein in,” said Konhaeuser. The senior now weighs nearly 115 pounds and says she is now the one doing the pushing, not the other way around. Say what you want, Konheasur is not to be messed with on the field or court. Like Konhaeuser, Mekhi Sargent has found his love for the sport on the football field. Sargent has broken numerous school records under the lights at Tommy Roberts Memorial Stadium. Averaging a total of 149 yards per game in his three years on the varsity squad, the senior surpassed 1,000 rushing yards in both his sophomore and junior years and broke 2,000 in his final season. “My aunt’s death really got to me and made me play the way I did in my senior year. Before her death, my mind was set at only 1,500 yards but when she passed away, it motivated me enough to surpass 2,000 yards,” said Sargent. The senior’s best year as running back came in his final year as the Conchs’ star running back. Sargent rushed for 2,094 yards, finishing 7th in the state for total rushing yards this past season according to MaxPreps. Along with rushing yards, the senior finished 10th in the state with 27 touchdowns on offense, a school record. Sargent now holds the records for most rushing yards in a game, a season, and a career. In addition, he set the record for single season scoring, career scoring and most career touchdowns. “My greatest memory playing football was when I broke the single game rushing record vs University School. It was the best because it was the first record I broke,” said Sargent. In the game against University School on September 4th, 2015, Sargent dominated scoring three touchdowns and breaking the single game rushing record with a total of 246 yards. Throughout the entire season, Mekhi was nearly unstoppable averaging 190 yards per game including nine 100+ rushing yard games. “It means a lot to know that you’ve had a strong impact on athletics, the most out of every other senior in every sport at Key West high school,” said Sargent. In his four years as part of the Key West High School football program, Mekhi Sargent finished his career with a total of 4,321 yards and 49 touchdowns, making him pound for pound one of the greatest running backs to wear a Conch jersey. Konhaeuser and Sargent will be attending college in the fall and plan to continue playing in their sports. Nicole will be attending Alabama State University studying criminology and hopes to go into the military. She will be playing both sports in her free time but hopes to possibly play either soccer or basketball for the Air Force. Sargent is heading to Iowa Western Community College, a top three National Junior College Athletic Association (NJCAA) team. After two years at Iowa Western, the senior plans to receive his Associates of Arts and transfer to a NCAA division one or two school to continue playing football. 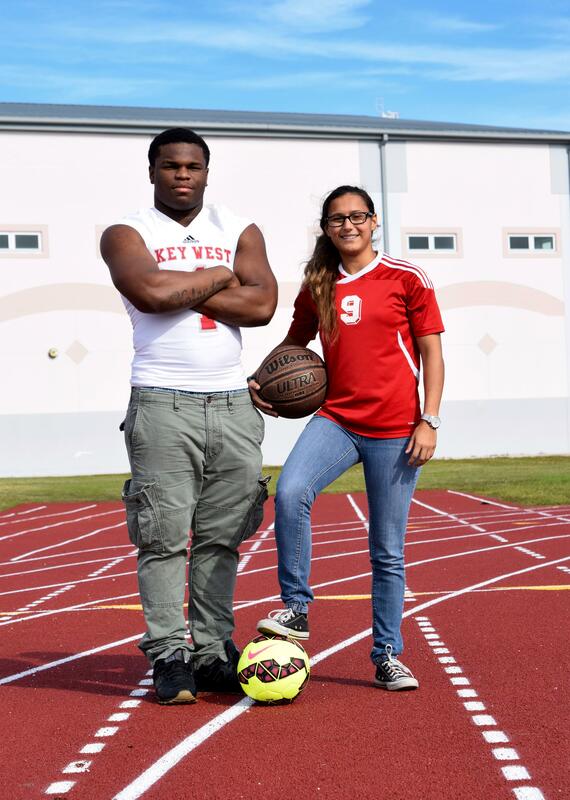 In their time at Key West High school, both Nicole Konhaeuser and Mekhi Sargent have proven why they are the most athletic seniors in the Class of 2016 on and off the field. This entry was posted in Girls Basketball, Girls Soccer, Key West HS Football.